Great comfort, perfect multi-pitch and all around shoe—very durable. 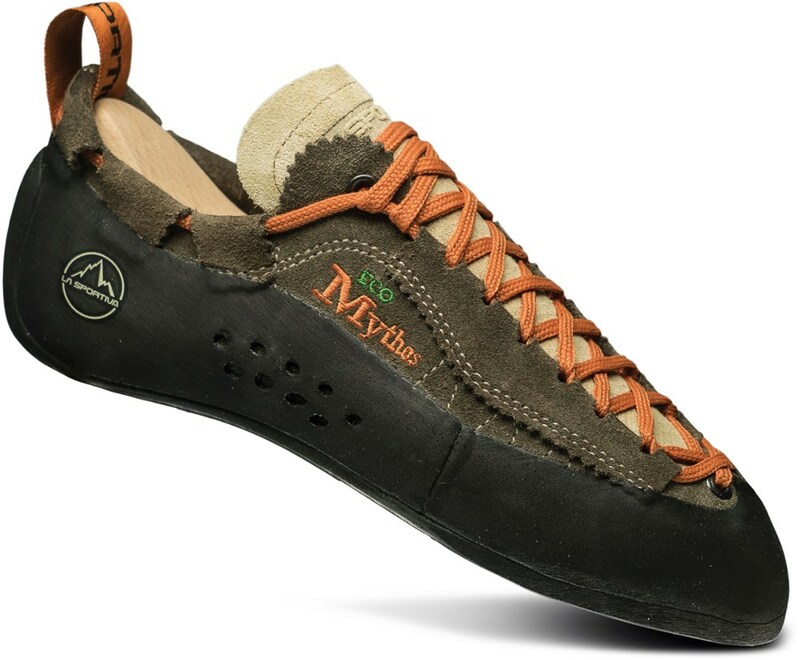 I had my Mythos for three years and have climbed with it on rock—usually sport climbing, vertical walls, slabs, chimneys, and multi-pitch. I have found it really comfortable (for me a big plus, as I cannot endure pain in my feet for climbing. 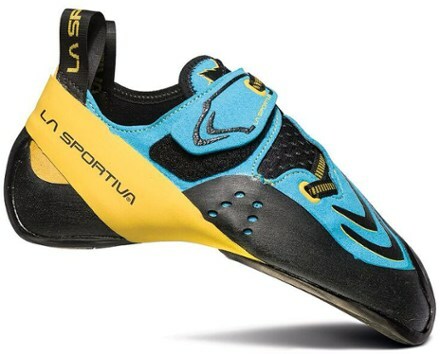 I simply cannot stand shoes that cause me pain in the foot/toes), and it does not have any of the new "plastic in the sole" P3 technology that La Sportiva does now (which makes your foot not feel the rock at all—I do not like that). So it is kind of a traditional "soft" shoe, still holding the ankles, the sole is flat, not like new aggressive shoes, but your foot learns the rock that way and your foot arch gets stronger too (compared to the artificial plastic hard lining. I have a pair of Katanas and I cannot use them because of not feeling the rock and pain). I do yoga, so also a reason why my feet are strong and prefer softer shoes. I actually can climb 7a-c little edges with these and smear against the rock. The rubber is great. Even though they aren't really for edging, and with time the original edge has worn off, but I can still use them for it! I bet your foot learns to work better in such a shoe. These are my second shoes and they're still in perfect condition after 3 (no need for resoling, no holes in the rubber yet), but i use them in alternance with a boreal. I am really amazed by how well you can climb with these shoes, how your foot learns the rock, and you can smear it into little edges. Regarding size, my feet are size 39 and the shoes are 37 (in Katana laces, I bought 38,5). Sure, I am thinking of getting a more precise shoe (but not Katanas, maybe Cobras?) something that's comfy, holds the ankle well, all around, but gives a little more precision on the front for small edges. All in all, my favourite shoe, I really recommend it to those who seek comfort, traditional old school shoes. 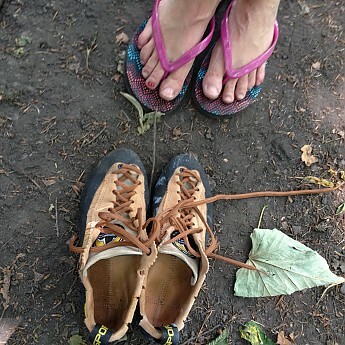 I actually have a great climber friend—he's 60, has put up loads of 7-8c routes in these exact shoes in the late '70s and '80s and he is still using Mythos to climb :) - I was proud to see that we are using the same shoe. Welcome to Trailspace, Ildiko! Thanks for the helpful review of your pair of Mythos. Do you have any pictures of them you could show others in your review? Thanks for the review, Ildiko! Used them since 1997. Comfortable — excellent fit to feet, can wear all day eg on 400m routes. Can be resoled, just make sure you don't wear the nose too much and get the 4mm resole. All round fit brilliant. Moulds even to very wide feet. Grip quite OK by me up to grade 22. I absolutely love these climbing shoes! My biggest surprise with these shoes was how well I was able to smear on the wall with them. I have had difficulty finding a shoe that is better than these. I definitely recommend this shoe. It fits perfectly and just molds to your foot. It is very comfortable and doesn't take too long to break in. I can wear these shoes all day if I wanted to and they don't pinch my toes as bad as some shoes do. 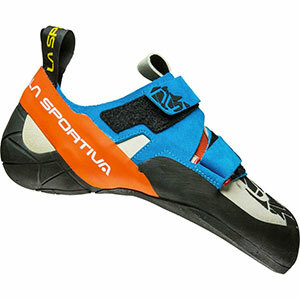 Although, I would love to find a climbing shoe that will give my ankle some support, these are very nice, and I never hurt my ankle in them. Thanks for sharing your rock shoes review, Lauren. Welcome to Trailspace! I have had these shoes for two years, and they are pretty good shoes. I was hoping for them to be a little more sticky. Fit is like a glove, they form to your feet nicely. Not very sticky, especially on cold days. I have been climbing for three years and I split my time between trad, sport, and bouldering. I bought the Mythos a year ago before a trip out to Indian Creek for the splitter cracks. I sized them a touch big for long days of jamming. Since then these have become my main shoes indoors and out, performing on vertical to slab to gym bouldering. 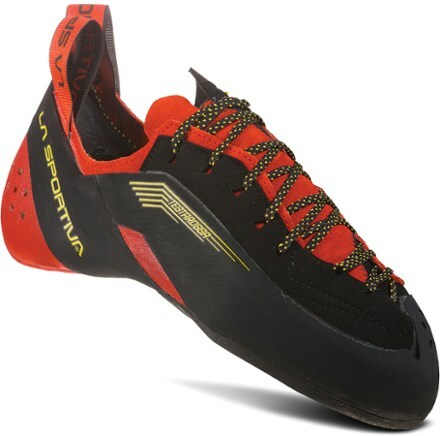 I have found the rubber to be as sticky as any other La Sportiva shoe and they do smear very well. The lacing allows for great adjustability to ones foot. A note on sizing: these shoes depending on how you size them can do any type of climbing except steep stuff and micro cracks. Size them small and tight and they are great for edging, vertical, and slab. If you size them a touch large they are great all day trad and crack climbing shoes. So it all depends on how you size them. 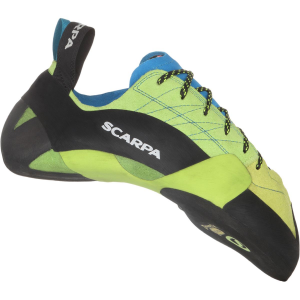 Comfortable shoe, very comfortable, nice for cracks, multi pitches or long climbs, but not very sticky, and not so great for face sport climbs. I've gone through four pairs of Mythos, some with 1-2 resoles (with Stealth rubber -- BIG improvement!). They're a good all-day shoe, great for cracks and decent edging too. Definitely NOT an aggressive sport or bouldering shoe however. The rubber tends to wear out quickly in the front of the toe in particular, and even new isn't really that sticky. In fact, the rubber can get very hard and slippery after a while, worse than most shoes. They stretch a LOT. My foot is size 9, my first Mythos were size 8 and they were quickly unusably large. I went to 6.5 which were tight and stretched to be comfortable even for long pitches or sessions. When I got my third pair I got the smallest shoe that I could physically cram my foot into, size 5, although initially the pain was too much to even stand on. Nonetheless they ultimately stretched to remain snug even in their old age and they are the ones I still use from time to time. Moral: get them 2-4 full sizes small. This is not a performance shoe and the rubber is sub-par. But they are well made, they resole well, they are comfortable, and are still my favorites for long days of easy to moderate climbing. But if you're going to push yourself hard, get a better shoe. Ahh the Mythos. 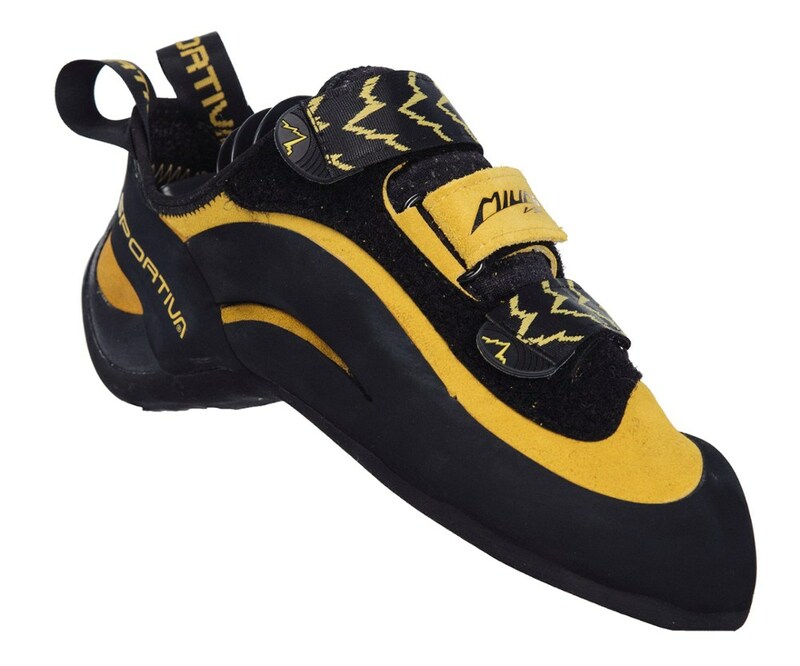 Perhaps my favorite climbing shoe of all time. By far the most comfortable shoe on the market. If you size it small enough, it is one of the best performing too. These are always in my pack for bouldering, slabs, cracks, and moderate face climbs. The sensitivity of these shoes are phenomenal. Also the new XS grip is the best rubber on the market, I prefer it over stealth c4 because it lasts longer and is stickier. 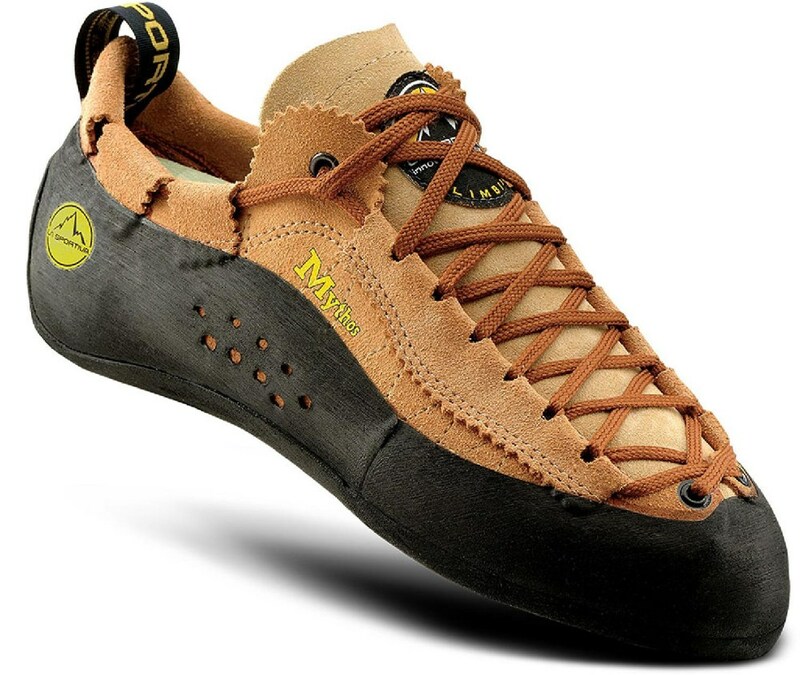 The leather on these is the softest in the climbing shoe world, giving them the best comfort and break in capabilites. The soft leather streaches to your foot. It does stretch about a size, so buy these mothers tight! Price Paid: $40 - eBay! Great for practicing footwork, felt the best when comparing shoes. I felt like I could really grow into it--my foot's second layer for climbing. Laces get in the way, but I double-tie them with no problem, and for some reason still prefer laces over velcro. It is a great shoe when you are improving your skills in footwork. I have had them for about two years, they rock. There are some drawbacks that I have had. When my foot started to sweat heal hocking is out of the question, my heal slides out. Overall it kicks a**.